Our boarding facility offers indoor runs for your medium to large sized dogs and smaller areas for your small dogs and cats. All boarding areas are climate controlled and cared for by our trained staff. 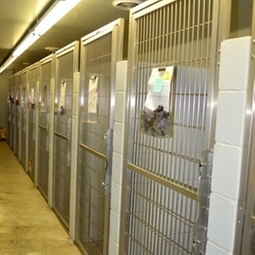 During your pets stay they will receive three individual walks per day. We feed Veterinarian recommended Hills Science Diet to all boarders. If you have a pet on a special diet feel free to bring your own food with instructions and we will be glad to feed your diet. If your pet stays three or more nights with us they will receive a complimentary bath, nail trim, and ear cleaning before they go home. Dhlpp, Rabies, Bordetella for all canine boarders. Fvrcp, Rabies for all feline boarders. If your pet is not current we can update them when they arrive for boarding. Please call ahead for a reservation especially during holidays and summer time. We strive to exceed your expectations and give your pets the best experience possible when away from their family.